You can now sign up to have Amazon donate to us each time you buy through them! 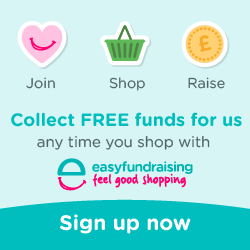 You can donate here and now using PayPal OR raise funds for us for free by signing up to easyfundraising (see below). We need to raise over £4,000 this year towards the library’s annual costs. So your help is really valued. You can now donate to The Library of Avalon via PayPal using the button below. Either a one-off donation or a monthly subscription. Also, you can raise funds for us for FREE! Did you know that whenever you buy anything online – from your weekly shop to your annual holiday – you could be raising a free donation for The Library of Avalon? There are nearly 3,000 retailers including Amazon, John Lewis, Aviva, thetrainline and Sainsbury’s, who will donate a percentage of the amount you spend to The Library of Avalon to say thank you for shopping with them. It’s really simple and doesn’t cost you anything. 3. Get shopping – your donations will be collected by easyfundraising and automatically sent to The Library of Avalon. It couldn’t be easier! Now, Just click on the image below and you will be taken to the right page and follow the easy instructions – it will only take a minute and raise funds for us without costing you a penny! We are so grateful for any donation you can spare. The trustees and volunteers of the library work tirelessly to keep this wonderful resource open and developing and we are very grateful to you for supporting us in our endeavour! With an annual rent and insurance bills of thousands of pounds to pay annually, as well as the costs of maintaining and developing the library’s unique and extraordinary book collection, we will always put your donation to good use! No one working for the library is paid – so all your donation goes towards the material maintenance of the collection and the provision of our services. You will see in the other pages on our website that we also regularly hold Symposia, matinee talks and book sales to raise the funds we need. We are grateful for your support of these too. We are also pleased to be able to offer beautiful unique library mugs and shopping bags in return for donations at the library. Our membership is not large and in order to keep membership fees affordable we do need to raise most of our income through other means. A donation of £15 keeps us open for a day!